A comprehensive, well-presented set of skirmish rules for WWII for 15mm, 20mm, or 28mm miniatures, resolving action at the individual soldier and vehicle crew member level. The designers' intent is to provide fast-playing rules which capture the spirit of ground combat. Units of both sides move in random order (determined by playing of cards), with each person able to perform two Actions per turn. Morale rules allow for fanatics, cowards and heroes, and Gut Checks are required before characters can perform highly risky acts. Rules cover artillery, engineers, armored and infantry combat, but do not cover air support. A generic squad organization is provided, and generic hit locations for tanks and halftracks; supplements will fill in more detail, as well as data for nationalities other than German, American, and Russian. Seven scenarios are designed to allow players to gradually learn the rules. Includes a chapter on making your own terrain, plus an introduction by Harold Coyle, author of Team Yankee. Easy Eight Enterprises Artic Thunder Supplement. 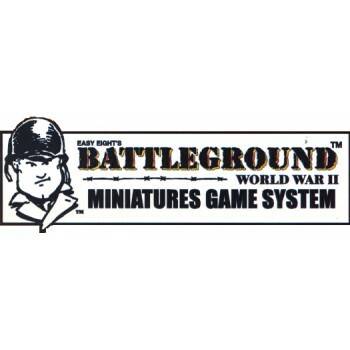 They went looking for a plane, they found much more..
Recreate your own battles of World War II with Easy Eight's Battleground World War II Miniature Game..
Battleground WWII Main Rules by Easy Eight Enterprises. The basic rules cover Americans, Germans, an.. Crusade for Empire is Easy Eight Enterprises’ Campaign Pack featuring the British and specifically t..
Fury in the Fatherland Rules and scenarios for American featuring US Cavalry and Reconnaissance unit..
Islands Of Glory is the first Campaign Pack released by Easy Eight Enterprises for the Battleground ..
Advance through the tough Ardennes terrain as Peiper, commanding Hitler’s last great army or prevent..
Men of Honor Rules and heroes of WWII, spiral bound. Men of Honor is Easy Eight Enterprises Scenario..
Normandy Nightmare Rules and scenarios for fighting in the hedgerows, spiral bound. Focuses on the h..
Panthers East Vehicles, rules and scenarios for the Eastern front, spiral bound. The Panthers East s..
Narva, 1944. This ancient citadel on the border between Estonia and Russia had seen endless battles ..
Red Devils in the Night Scenarios and rules for British paratroops is the first scenario Pack for Ea..
Tankers Challenge Vehicles and additional rules for all theaters, spiral bound supplement includes 3..